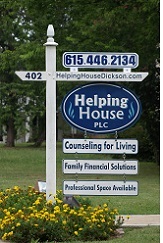 Helping House is located on the edge of downtown Dickson in an area where charming old homes are being used as businesses. With 2 stories and 2 full baths, 5 rooms are designated for direct service. The kitchen has been child-proofed and serves as a playroom. This space is used for a children's waiting area. 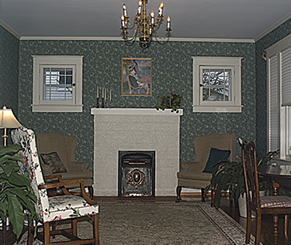 In addition, there is the waiting room and the business office. An enclosed back porch provides storage as well as a private entrance for staff. The basement adds to the ample storage on both living levels. The living room is used for waiting. When scheduled at a time when no other clients are in the house, the space is large enough to accommodate extra chairs for counseling groups. What could make waiting more fun than a room just for children. Through the doorway off the business office, this inviting space is filled with a wide range of toys for individual or shared play. A whole wall covered in chalk paint is a favorite. 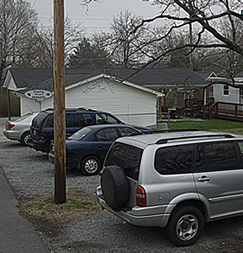 Private parking is available in the rear of the building. 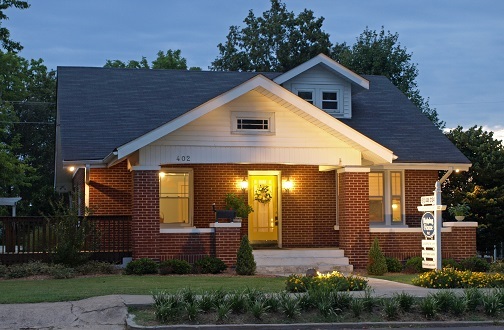 The lot and the exterior of the house are well lit. The big, black dog statue at the end of the paved driveway greets all. 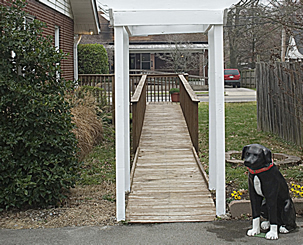 By following the walkway to the front door, one encounters no architectural barriers. 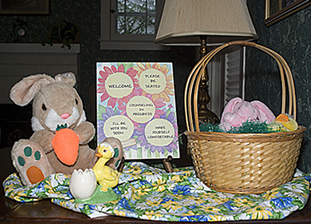 A seasonal display on the table just inside the front door is a warm welcome to all.